Initial lower cost and speed of erection are two of the primary reasons that building owners select pre-engineered metal buildings (PEMB) over conventional structures. But there’s more. Business owners also appreciate how easily metal buildings can be modified to gain peak operational efficiency. The primary differences between a metal building and conventional commercial construction rest with the physical structure itself and the outside covering. Let’s explore each a bit more. A Metal building has large, rigid rafter frames, typically spaced 25 to 30 feet apart that are connected to each other by cold formed, 16 to 12 gauge Zee purlins commonly spaced 5 feet apart. The purlins are run straight with no camber, so when they are installed and the dead loads are applied, they will naturally deflect downward between the rafter frames. (This is a really important point that will be addressed in more detail later.) The purlins are also lapped and connected to each other over the rafter frames. The metal roof and walls of the metal building are then attached to the purlins with batt insulation under the roof or wall sheets. Common roofing options for metal buildings include 26 or 24 Ga exposed fastener panels and 24 or 22 Ga. concealed fastener standing seam panels. It’s important to note that exposed fastened panel styles provide structural diaphragm to the building and standing seam panels typically do not. Consequently, when the building is initially designed and engineered the style of roof covering is a critical element. TIP: It’s important to understand that the exposed fastener roof panel isn’t just cladding for a metal building. Instead, it is an integral part of the structure itself and modifications to it need to be seriously considered. In conventional construction, the structure supporting the roof system typically consists of pre- cambered bar joist rafters spaced 5 to 6 feet apart with a 22 gauge or heavier roof deck attached to the bar joists. Once installed and the dead loads are applied, the bar joists should level out. The roof system, whether it is metal, single ply, modified or built up, is then attached to the steel deck. Single ply roofs are assemblies made from five to twelve foot wide rolls of reinforced membrane, 40 to 120 mils thick that can be attached to the underlying roof deck in at least 3 different ways. In all cases, there is rigid insulation on top of the steel deck and most of the time there is a fiberglass mat gypsum board between the membrane and insulation. These are assembled and attached to the deck in a very particular manner. Here are ways single ply roofs are attached to the deck. Heat welded to the top of special coated bearing plates that sit on top of rigid insulation or cover board. The bearing plates are attached to the deck below with long fasteners. Fully adhered to the rigid insulation or cover board using an adhesive. There are 3 basic types of Single ply membrane on the market today. TPO is a Thermoplastic Polyolefin and is the most popular, least expensive system available. PVC is Polyvinyl Chloride and EPDM is Ethylene Propylene Diene Monomer. Each has their advantages and disadvantages. For the long term quality minded buyer, a metal building with a standing seam roof offers the longest (and least costly!) total service life. Unfortunately though, not every new building owner has the budget for a standing seam roof. In these cases, exposed fastened metal panels on a metal building offer a viable solution. There are literally billions of square feet of these panel types installed that have been performing as intended for many decades. The problem is that over time, these exposed fastened panels can begin to leak where the fasteners are holding the roof panels to the purlins, around penetrations and at end laps. This occurs due to the natural expansion and contraction of the steel panels during heat cycling. 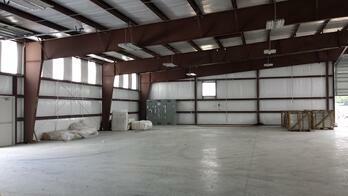 Using a single ply to recover a metal building is a very common application in these situations. Owners often select this option because they are much easier to install than a metal roof, require a lower skill set for the installer and offer a lower initial cost. The important thing to remember is that the metal building was structurally designed to perform with a certain style of roofing. Modifying the roofing material can completely change the way the building does (or doesn’t!) perform to loads such as rain and snow. Yet owners continue to install a membrane roof system, which was intended for conventional construction, over a metal building style facility. So Why do Owners Change the Roofing Material? As we’ve seen, these two types of buildings are designed completely different. Why then do building owners throw caution to the wind and think they can mix and match the roofing material? Their decisions usually come down to three factors: cost, performance and a lack of education. Let’s start with cost. Cost: In any discussion of cost, it’s important to consider both “initial” costs and costs over the life of the building. When owners are faced with leaks caused by water entering around the fasteners on exposed fastened roof systems, there is no doubt that the “cheapest” initial cost is to place insulation in between the ribs of the panels and then cover the entire surface with a membrane or TPO type material which offers a 15-20 year life expectancy. Installing a concealed fastened standing seam roof over the existing panel will have a higher initial cost; however, it can routinely be expected to offer 50 plus years of worry free service for the owner! Performance: Generally speaking, the best long-term performance roofing option for a metal building is a free floating standing seam roof system with limited penetrations and no end lap joints. But as we just addressed, that superior performance comes with a higher investment. Enter the membrane roofing option. While the life span of a membrane roof is easily half that of a standing seam roof, they do fall in between the standing seam and exposed fastened options with regard to both price and performance. Both standing seam and membrane systems frequently offer weather tightness warranties, which are not available on exposed fastened panels for obvious reasons. Excluding water intrusion, metal roofs are typically much less susceptible to damage from hail, and physical damage than the membrane options; however, they can be more susceptible to corrosion from salt spray or chemicals than conventional roof systems such as shingles, single ply or modified bitumen. Education: The number one reason not to put a single ply on a metal building is the fact a metal building is designed to have a metal roof on it. But most building owners simply don’t understand the building dynamics. Our goal is to help educate these owners. When a structural engineer designed the original building, he planned for the metal roof to channelize the water flow to the eave which ensures equal loading across the entire structure. Conversely, conventional constructed buildings with flat roofing products were designed to support loading differently. This is the reason that the International Building Code allows a purlin in a metal building to deflect downward 20% more than a Bar joist in a conventional structure. The writers of the code recognize that the load on the purlin will be equally distributed across the entire structure because the ribs on the metal roof panel force the water from ridge to gutter. Conventional construction buildings designed for smooth surface single ply, modified and built up roofs are constructed with cambered bar joists and steel decking. These cambered bar joists provide a flat surface that ensures equal loading on a conventional structure. A smooth surface roof on a metal buildings with lower slopes can cause the water to flow down the middle of the purlins where they are naturally already at their greatest deflection. Normally, this is not an issue unless one purlin, normally the first one up from the gutter, gets over loaded. There are a lot of ways this can happen, but if a purlin gets over loaded, it will cause the purlins in the adjacent bays to rise because they are lapped and connected to each other over the rafter frames. Once the adjacent purlins rise, they force even more water on to the comprised area. This phenomenon can cause roof collapse as depicted below. 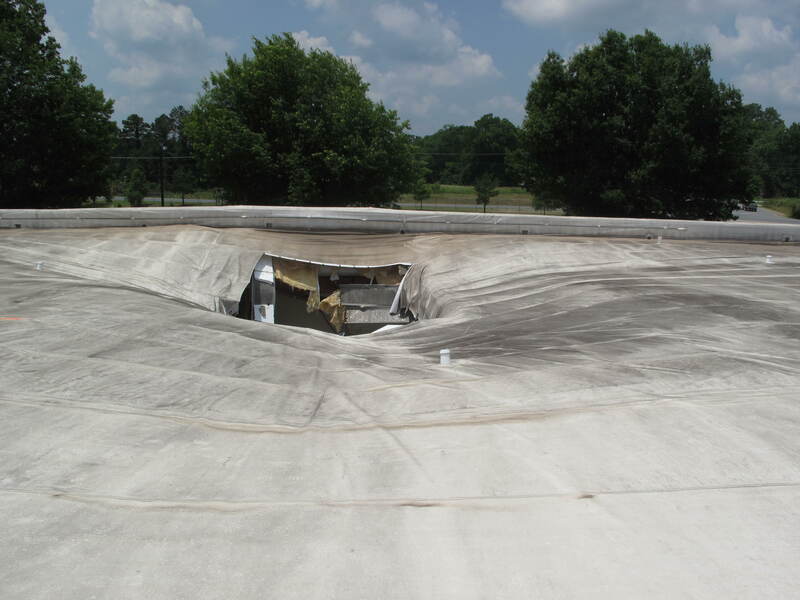 Learn more about structural and safety concerns with Single Ply Recovers in this Professional Roofing Magazine article. So what are the five most important things you should consider before recovering an exposed fastened metal roof with a smooth surface membrane? How you are changing the loading of the building? 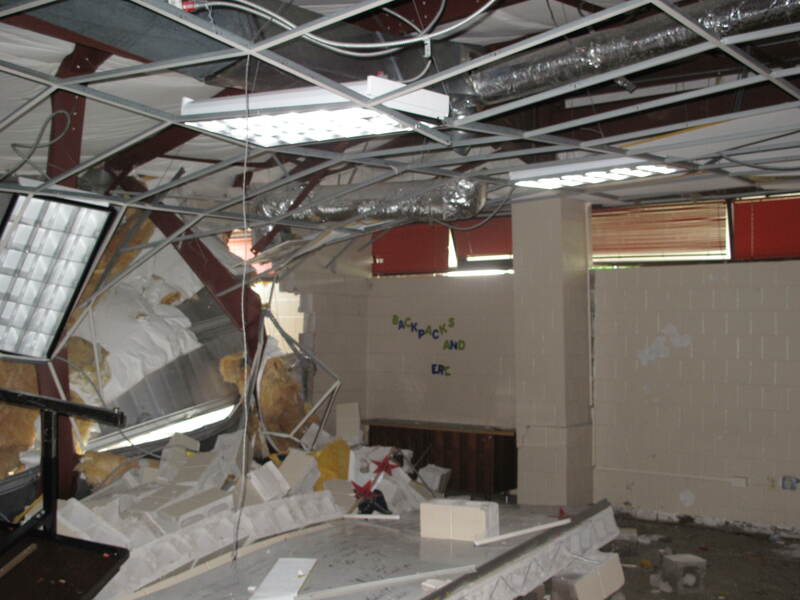 What impact would building collapse have on your business? Which is more important to you-Initial Cost or Total Cost? If “Initial” cost, this one goes to Membranes. If “Total” cost, at 50 plus years’ service life, this one goes to metal.